The Met Police says it's treating the incident as terror-related until they know otherwise. London police has confirmed that at least four people have died in the Westminster attack, including one police officer and the attacker. Two people died on Westminster bridge. At least 20 police are said to be injured. The full details of exactly what happened are still emerging. But, having been updated by police and security officials, I can confirm that this appalling incident began when a single attacker drove his vehicle into pedestrians walking across Westminster Bridge, killing two people and injuring many more, including three police officers. This attacker, who was armed with a knife, then ran towards Parliament where he was confronted by the police officers who keep us–and our democratic institutions–safe.Tragically, one officer was killed. The terrorist was also shot dead. Speaking just a few hours after the horrific events of this afternoon, she praised the police and bystanders who were quick to run to the aid of those at the scene. "Once again today these exemplary men and women ran towards the danger even as they encouraged others to move the other way... That they have lost one of their own in todays attack only makes the calm and or under pressure all the more remarkable." "Tomorrow morning, Parliament will meet as normal. We will come together as normal. And Londoners—and others from around the world who have come here to visit this great City—will get up and go about their day as normal. They will board their trains, they will leave their hotels, they will walk these streets, they will live their lives. And we will all move forward together. Never giving in to terror. And never allowing the voices of hate and evil to drive us apart." 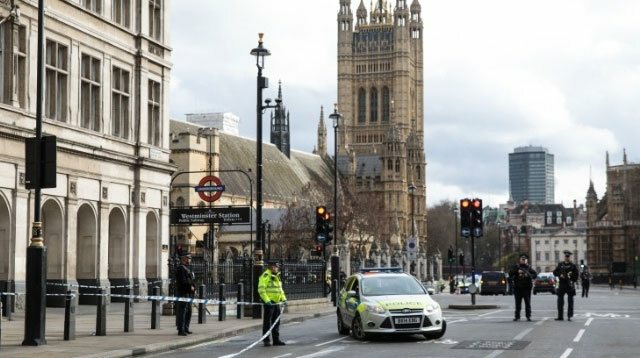 The London ambulance service deputy director of operations, Pauline Cranmer, earlier confirmed that they treated at least 10 patients on Westminster Bridge. "We have declared a major incident and our priority is to assess patients and ensure that they are treated and taken to hospital as soon as possible," she said earlier today. Meanwhile, the Port of London Authority confirmed that a seriously injured woman was recovered from the Thames river. The Telegraph also earlier reported confirmation from junior doctor Colleen Anderson at St Thomas' Hospital that one female pedestrian has died and numerous others are being treated—some with "catastrophic" injuries. "I confirmed one fatality. A woman. She was under the wheel of a bus. She died, confirmed her death at the scene," the doctor said. "There were people across the bridge. There were some with minor injuries, some catastrophic. Some had injuries they could walk away from or who have life-changing injuries. There were maybe a dozen [injured]." she added. The Metropolitan Police announced it will be treating the incident as terror-related "until we know otherwise." In a statement, Metropolitan police commander, BJ Harrington, said a "full counter-terrorism investigation is already under way." May added tonight: "The United Kingdom’s threat level has been set at severe for some time and this will not change." Commander Harrington explained he was delivering the official statement in place of the Met's current acting commissioner Craig Mackie because Mackie had actually been on the scene as the incident occurred, and is now a key eye-witness. It was confirmed he was not injured himself, but that his witness statement may prove invaluable when this case goes to court. According to The Telegraph's political editor Gordon Rayner, who was at the scene today, police responded to the attack by shooting the "intruder" three times at close range in retaliation. Rayner's eye witness account describes a "loud noise that sounded like a car crash, followed by screams, followed by a handful of people rushing." Transport for London closed Westminster underground station following a request from the police. Prime Minister Theresa May was then seen being escorted from the scene in a silver jaguar (seen in picture above), accompanied by the "biggest security guard you have ever seen," according to MP Andrew Bridgen. In the Met Police statement, BJ Harrington urged anyone on the scene to share any film or video footage they took as it may prove vital in determining exactly what happened in the investigation. He reassured viewers that "public safety is our top priority," and confirmed that "additional officers will be deployed across the capital," this evening, both armed and unarmed.